It is important to keep learning new things. In The Artists Way, the author says to continually re-stock the well of your mind with new ideas. In Darwin theory, the law of requisite variety says that the one with the most ways to adapt will survive and flourish. If you want to survive and flourish, you had better be adding to your repertoire of ideas. A business spotlight is the opportunity to give a presentation about your business at a networking meeting. Most Chamber Of Commerce meetings or networking meetings offer spotlight opportunities to their members. They can be about 10-15 minutes in duration usually. I have been a member of Toastmasters since 1992, and always have lots of fun there. A while ago I decided to present a speech on the topic of toast itself. 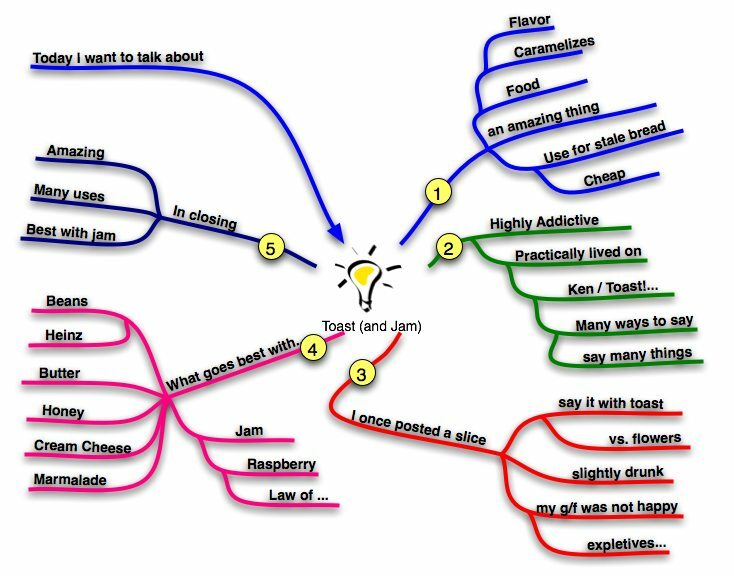 You can see the mind map of the speech I presented by clicking on the thumbnail here. As of today we are now on a separate domain www.bigdreams.ca. Big Dreams has been around for over 12 years now. It started as a print version, published monthly, and soon moved to the web around 1994. For most of that time it has been under the domain I have for my coaching business. I thought it was time to give it a separate domain. I often say, if you have a finite budget for marketing, you should spend less on advertising and invest it in your customers in some form of customer appreciation. You will get a better return for your money when you invest in your existing customers. Les Brown , an American motivational speaker, says that we are all born on this planet with a purpose. We all have gifts, a responsibility and an obligation to make a positive impact. Unfortunately, most of us do not know what ourpurpose is and we have to discover it. And worse, we are often unaware that we have to discover our purpose. How you take care of your customers is a key factor in your business success. If you take good care of your customers, then you get to keep them as customers, plus they will multiply. Since I got lots of interest in my last article on worrying, here is some more on the topic. Do you spend too much time worrying about things? Do you feel that it is cutting into your ability to succeed in life? When you worry about future events, your attention is literally pulled into the future. The scary thing is that as you focus on what may come, you may be inadvertently causing it to happen. That has to make you worry even more!